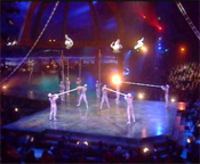 Historic Blog at BusinessQuests: Cirque du Soleil: what a business! marketing machines I have ever seen. of the place (Tour & Taxis, Brussels), everything went smoothly. where it takes you an hour just to get out of the parking area). revenue from tickets (just a wild guess). I really find this company stunning and a great model for anyone interested in excellence.